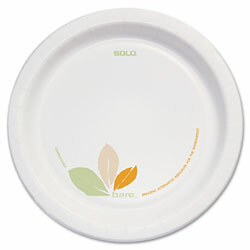 Serve smart on Bare® Eco-Forward® sturdy and attractive dinnerware. Offered in low case count Perfect Pak®, ideal for limited storage space. Clay-coating minimizes the potential for soak-through. Cut- and grease-resistant. Dinnerware Type: Plate; Material(s): Paper; Shape: Round; Diameter: 8 1/2". INNER PACKAGING: 2 Packs Per Case. 125 Plates Per Pack. 8.5" White Paper Plates from Solo Inc.! 998 In Stock today.